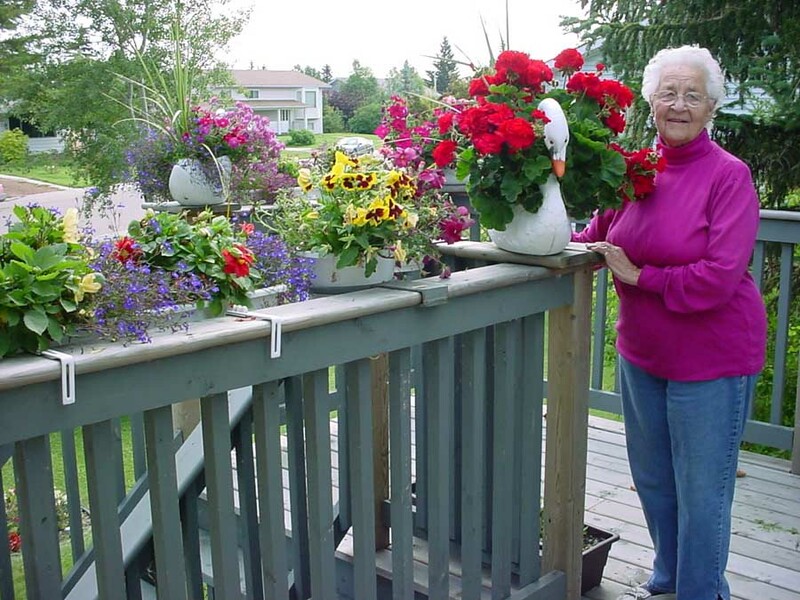 In 2000, after 35 years on the farm, Laura and Wilfred bade a tearful farewell and moved to a home in Cold Lake just a few blocks from Frank and Louise. The move was initially difficult for Wilfred as he had lived on the farm for over 60 years. However, once in their new home, the couple again worked hard on the lawns and gardens and created a neighbourhood gem. Having become accustomed to the large deck that Frank and Wilfred built on the farm house after it was moved to the new farm site, Wilfred, Harold, Kari (McNeill) and Ashley (Yochim) constructed a large deck on their new home, a deck that continued to provide years of enjoyment for family and friends. Sadly, in 2002, after a lingering illness, Wilfred passed away in the Cold Lake hospital and is much missed by his family and friends. We shall always treasure those years on the farm. Photo: Laura had a lifelong love affair with flowers. 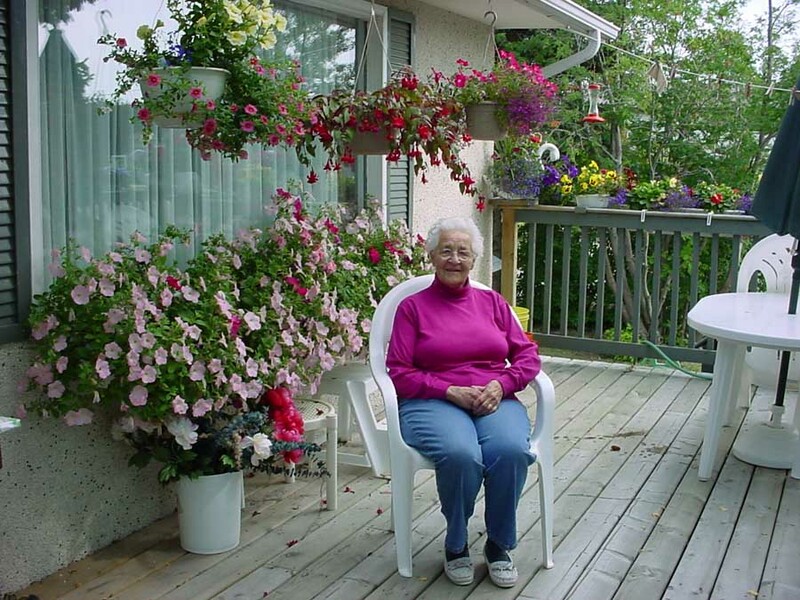 From the very earliest years on the homestead until the day she passed away in 2008, her house was always surrounded by flowers every summer. While the passing of Wilfred brought to a close another chapter in the extraordinary life of Laura, true to her pioneer spirit, she continued her winning ways with a “warm welcome” for anyone who might chance to pop by for a coffee or home made pie or pastries. While Laura scaled back in some areas she continued to maintain a wonderful array of flowers and always had fresh baked bread and pastries for her family and friends. As she is fond of saying: “I love my Bosch” and she used it almost everyday to whip up a little something. Who can ever forget a big helping of her homemade bread and gravy or those buns that have became legend within the family? In July 2008 the entire family and dozens of friends gathered to celebrate Laura’s 90th Birthday at the Cold Lake Community Centre. One highlight of many at the celebration was a “Parade of Quilts” in which twenty-five children and grandchildren paraded into the hall carrying baby quilts that had been lovingly designed and sew by Grandma over a twenty year period. In attendance at the party were mom’s three surviving siblings, Marcia, Helen and Shirley along with the sole surviving sibling on the McNeill side, Patricia Humphrey. There were also dozens of family members from Wilfred’s side of the family, many of whom still live in the Cold Lake area. At the time of Laura’s death in December 2008, she had two partially completed quilts for babies that would soon be joining the family. Following her death, Louise and Lynn completed the quilts using Grandma’s original designs. 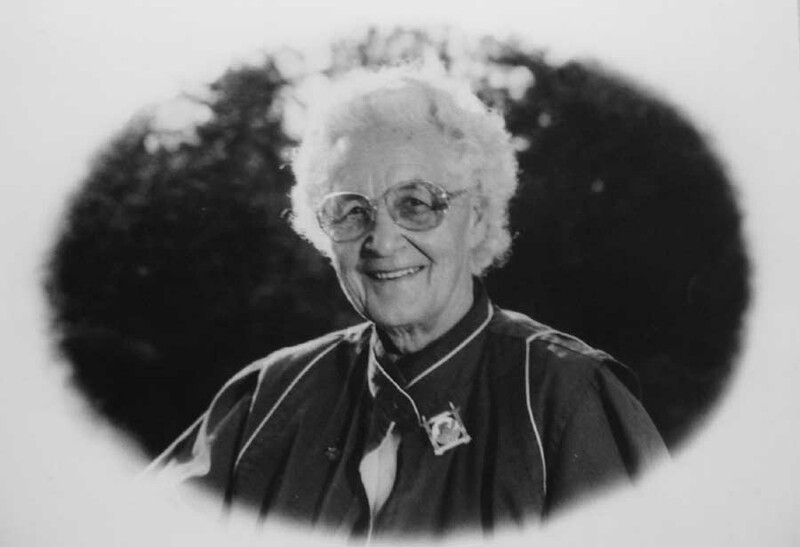 Laura was a true Canadian pioneer who made the world a much better place and who served as a role model for her children, grand children, great grandchildren and everyone in her community. We loved her to bits and we shall all remember that grand chapter in our lives. Photo: Everlasting image of Laura Isabel Skarsen in her mid eighties taken about 2002 while visiting her son and family in Victoria. Harold, Lynn, Louise, Frank, Dianne, Michel and all of your Grandchildren, Great Grandchildren, Great-Great Grandchildren, extended family, friends and neighbours. July 2008 Laura surrounded by flowers that she carefully planted and cared for over the spring and early summer.